Hennepin Healthcare has been providing hyperbaric oxygen for patient care and research continuously since 1964. We are one of the few of institutions in the US providing 24/7 availability of hyperbaric oxygen for emergency patients. Hyperbaric oxygen (HBO) is used for specific medical conditions. HBO has long been recognized as vital in the resolution of critical medical conditions such as gas gangrene, carbon monoxide poisoning, cerebral arterial gas embolism, and decompression sickness. It is also an important adjunctive therapy for other emergent conditions, such as necrotizing fasciitis, sudden sensorineural hearing loss, and compromised skin flaps or grafts, and for chronic medical conditions such as refractory osteomyelitis, osteoradionecrosis, delayed soft tissue radiation injury, and Wagner 3 or greater foot ulcers in diabetic patients. The flexibility of the three multiplace chambers allows multiple routine patients to be treated at one time, while also treating one or more critically ill patients in another chamber. There is always a medical attendant inside the chamber with the patient(s). For critically ill patients, the inside attendant is a critical care nurse and/or physician. Treatments are supervised by an attending hyperbaric physician. The facility meets all applicable ASME , NFPA, ISO, and FDA regulations. The Hyperbaric Medicine program at HCMC was recertified by UHMS "with distinction" in 2010. All facility personnel are certified in hyperbaric medicine within their job class. The technicians who operate the chambers are certified hyperbaric technicians and certified as care givers at least to the EMT or DMT level; the nurses are RNs experienced in critical care and certified as hyperbaric nurses; the physicians are board certified in Emergency Medicine and subspecialty certified by ABMS in Undersea and Hyperbaric Medicine. 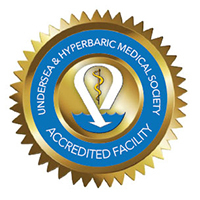 Hyperbaric Medicine is “Reaccredited – with Distinction” from the Undersea and Hyperbaric Medical Society.